Sometimes, even on a vacation or travel adventure--a busy, tired family just needs a quick and easy dinner--preferably delivered to the hotel room at the end of a long day. A recent trip to Minneapolis found us tired, hungry, and just returning to our hotel room after a 14 hour day at 7pm. One daughter was exhausted, one was battling a migraine--we were all starving--and the temperature outside had dipped to below freezing. Pizza was on the menu--and the front desk of our hotel suggested Pizza Luce. The pizza came with high recommendations--and Pizza Luce would deliver right to our hotel room door. 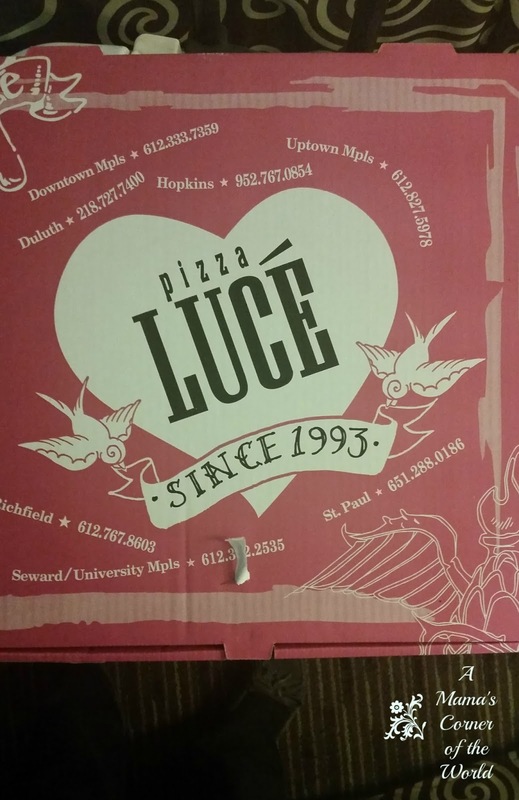 What was our review of Pizza Luce in downtown Minneapolis, Minnesota? Our Pizza Luce Experience. I wish we had been able to go to Pizza Luce for a dine-in meal--but, 2 of the four of us were having "Snickers moments", one was in bed with her head under a pillow, and we were all ready to put on pajamas and call it a day! I rushed to order dinner without really reading the full, online menu options thoroughly. I had a flyer from the front desk--and I zoned in on the pizza category online. There were several specialty pizzas that I would have loved to try--like the Fire Breathing Dragon or the Wild Mushroom and Arugula pizzas--but, my goal at that time was to find something (quickly) that both our picky daughter and our under-the-weather daughter would and could eat for dinner. While we didn't get to experience the actual Pizza Luce restaurant or its servers--we still experienced a bit of the restaurant. The Ordering Process. I ordered online--with my phone. For many of you--that may sound perfectly ordinary and usual--but, I hate using my phone for online orders and such when I'm out of town. The Pizza Luce website is set up for mobile ordering--and it's set up for downtown delivery. I had zero issues ordering my pizza, using my discount coupon, or with requesting my delivery to my hotel and room number. The Pizza Luce Delivery. I expected that one of us would need to retrieve our food from the hotel's lobby. I expected the delivery to take beyond the 25-30 minutes the site noted...and I expected to need paper plates to heat up the pizza in the microwave when it arrived cold. Wow. No. Not. At. All. The pizza was delivered right to our hotel room door by the delivery driver--well within 30 minutes--and piping hot in the Minneapolis snow & cold. How was the Pizza Luce food? The pizza promised Italian sausage, pepperoni, Canadian bacon, mushrooms, green peppers, onions, a Muffuletta olive mixture and mozzarella cheese on a hand-tossed crust with homemade red sauce. I ordered a large--and there was enough for dinner as well as a couple of pieces for the next day's lunch when we combined it with chips, veggies, and some salad leftovers. Would we recommend Pizza Luce? Chris and the girls liked the pizza a lot--and were more than happy to devour the cold leftovers the next day. 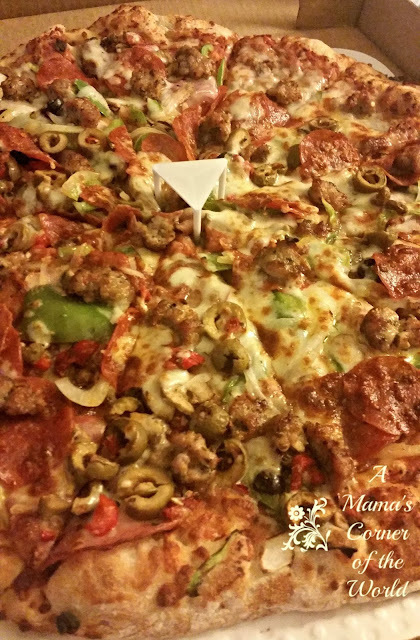 I wasn't a huge fan of the crust taste and texture--but, sometimes. traditional, hand-tossed pizzas are not my favorite--and I am accustomed to being "outvoted" on both crusts and sauces in my little corner of the world. 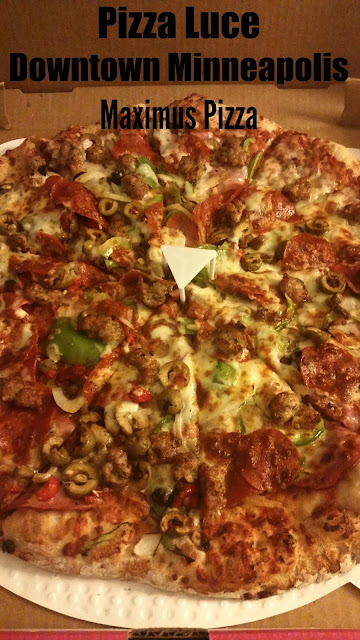 Everyone else loved the crust--and we all especially enjoyed the sauce (which doesn't always happen in my world!) and the Muffeletta olive mixture. I would certainly recommend Pizza Luce if you are in the downtown, Minneapolis area for lunch or dinner--and I would not hesitate to order again from a hotel room for delivery. If we return....I have a list of items from the Pizza Luce menu that I would like to try--especially some of their MANY vegan and gluten free selections. While the restaurant isn't meatless by any means...and is Italian in theme--they have so many options for vegan and gluten free diners. I love that in a restaurant! I would go to the restaurant in person, if possible--for the experience--but, I also wouldn't hesitate to order a variety of options from the menu for delivery either. They claim to deliver through a variety of weather situations--and that is always valuable to winter-month visitors! And--remember--they offer options for vegans/vegetarians/and gluten free diners--so your dining itinerary is easily simplified if dining with a diverse group of eaters! Be sure to read through the entire menu online. They deliver the full menu--and they offer a variety of sandwiches, pastas, salads and appetizers for a variety of tastes--and dietary needs. Disclosure: We were not compensated for this review. We simply experienced the restaurant and wanted to share it with our readers! All opinions are our own. Do you have a favorite restaurant we should visit? Over the next two months...we will be in Cleveland, Pittsburgh, Central Ohio, Northern Kentucky, Eastern Indiana, Southern Virginia and West Virginia. Email us your favorites--and if we visit--we will certainly send you a shout-out!